Robert Mueller’s failure to establish a criminal conspiracy between Donald Trump and the Russian government has set off a wave of revisionist attacks from both the right and the far left. Even though the full details of Mueller’s report remain secret, Trump’s defenders insist that it has negated not only the wild hopes that Trump might be removed from his job through prosecutorial means but over two years’ worth of reporting on his suspect relations with Moscow. I am not a reporter and have not broken any of the stories Trump’s defenders are now trying to discredit. But I did write a long feature last summer tying together the body of reporting as it stood at the time into a narrative exploring the Trump-Russia relationship. That story placed me among Trump’s targets for revenge. But just as Trump’s defenders barely managed to discredit any of the reporting on the Russia scandal, they have not debunked the major conclusions in that piece. Having reread it in light of the ten months’ worth of revelations that have followed, I believe the story holds up extremely well. Indeed, subsequent events have vindicated its most important predictions and claims. A recent wave of criticisms of this story replicated the theme of the original pushback, which is an accusation that the story calls Trump a “Russian agent.” The story does not make such a charge, which would be a ridiculous and totally implausible thing to believe. Some critics have also seized on a chart that accompanied the story. I didn’t see the chart until the story was published, and I assume its intent was a somewhat playful treatment of the subject matter, though it’s fair to conclude that the irony was lost on most readers. In any case, the decorative art has no bearing on my argument. To be fair, while my piece did not promote the “Russian agent” fantasy, it has gained some currency on social media. But to try to understand Trump in these terms is to fall for a spy-fiction-level analysis of how Russian intelligence works. A wide array of counterintelligence experts have explained that Russia really does make a concerted effort to compromise foreign dignitaries in politics and business. But the process is subtle, often affable on the surface, sometimes resorting to outright blackmail but more commonly using greed and persuasion as levers. I likened the relationship between Trump and the Kremlin to the sorts of covert ties Russia has formed with right-wing politicians in other Western countries. The data we have seen since my story ran has largely bolstered its conclusion. 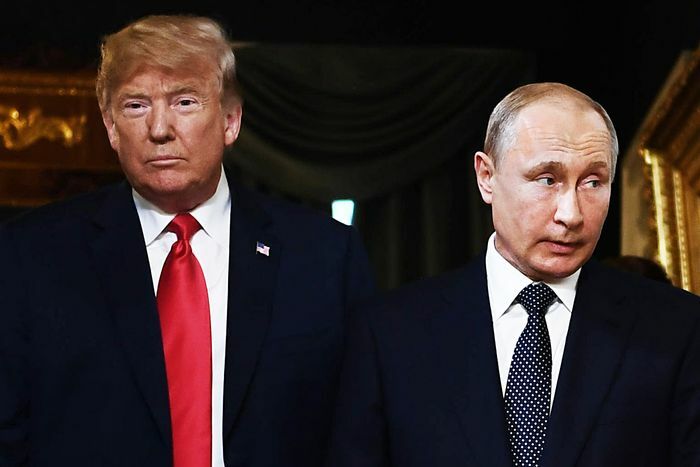 Shortly after the piece ran, Trump flew to Helsinki and appeared strikingly and uncharacteristically submissive alongside Putin. The Washington Post reported that Trump has gone to extraordinary lengths to keep his meetings with Putin secret from his own government, barring national-security experts and even personally confiscating notes on one discussion. Trump also made a series of oddly Russophilic comments, ranging from repeated attacks on NATO to calling Montenegro a “very aggressive people” who might attack Russia to justifying the Soviet invasion of Afghanistan. Some of the potential links I noted appear less probable today. A suspicious server that might have been used to transmit campaign data was reported on inconclusively by The Atlantic’s Franklin Foer and The New Yorker’s Dexter Filkins. The fact that Mueller has not filed any indictments related to the server, which would seem to create an avenue for a conspiracy charge, reduces the probability that it played any important role in the campaign. Likewise, my story cited a McClatchy report that Mueller obtained evidence that Michael Cohen visited Prague during the 2016 campaign, but Cohen’s recent testimony to the contrary renders that prospect exceedingly remote. The most dramatic possibility I mentioned in the story, which has also been the subject of the widest ridicule, is the possibility that the Russian compromising of Trump dates back to 1987. This was not my main thesis, but it was a possibility, a “small but real chance — 10 percent? 20 percent?,” as I put it at the time. The facts I cited, in sum, were that Trump held a few meetings with Soviet officials, traveled to Moscow, discussed the possibility of building a tower there, and shortly thereafter began attacking American allies and discussing a presidential campaign, neither of which he had done previously. I still think Soviet intelligence was probably just sniffing around Trump back then, and didn’t gain any real inroads until probably the 2000s, when his business became heavily reliant on Russian funding. But nothing we have learned since last summer has made this unlikely-but-not-impossible scenario any less likely. Indeed, there is one development that gives it more credence: The now-confirmed fact that Trump was pursuing a deal to build a tower in Moscow during the campaign. Russia was floating a Moscow tower deal at the time Trump explored his first campaign, in 1988, and also floated a Moscow tower deal when he ran in 2016. We know Russia dangles lucrative business deals in front of foreign politicians as a foreign-policy tactic. (Russian influence scandals have popped up in Britain, France, Ukraine, and most recently in Italy, as well as elsewhere.) The pattern usually involves Russians luring foreign partners with surefire-profit business deals involving things like gold or silver mines or diesel fuel. Trump’s can’t-miss deal was a tower. Maybe the 1987 iteration of the tower deal was nothing more than a straight-up business arrangement, and only by 2015 did it morph into a pretext to slip a fortune to an American presidential candidate. Maybe not. That is to say, the FBI was investigating the exact same scenario I posited in my story. And while we know Mueller has not found enough evidence to charge Trump with a criminal conspiracy, the results of the counterintelligence probe have yet to be disclosed. In the meantime, Trump’s defenders have seized upon the absence of criminal conspiracy charges to wish out of existence a massive trove of un-rebutted facts. Some of these defenders are the very people who have promoted claims that actually have been discredited — like Glenn Greenwald and Matt Taibbi’s skepticism that Russia hacked the DNC, or the various right-wing water-carriers for Devin Nunes’s crazed conspiracy theories. The story I wrote last year was ahead of the interpretive curve but very much in line with the known facts. At that time, all the dots pointed to the likelihood of a hidden, corrupt relationship between Trump and Russia. By now, we know this — once a dark possibility — to be true.